For thousands of years, a migration of majestic proportions has played out annually in the wild rivers of the northwestern United States. Sockeye and steelhead salmon return to the rivers in which they were born, swimming upstream for hundreds of miles against ferocious currents in order to spawn and die. To reach their spawning grounds, fish populations of the Snake River navigate more than 900 miles, ascending an astonishing 6,500 vertical feet--the highest climb of any salmon population. The Snake River's salmon spawn in the high, clear waters of one of the largest and most intact wild areas of the coterminous United States. Their annual arrival is not only the climax of their remarkable life cycle; it also represents a huge influx of nutrients to the ecosystems of central Idaho, northeastern Oregon, and southeastern Washington. Dozens of species, including bears, wolves, eagles, ospreys--and humans--benefit from this unlikely delivery, courtesy of Mother Nature, of fresh seafood to inland North America. Although the journey from ocean to spawning area has always been arduous, human activities have brought daunting new challenges. 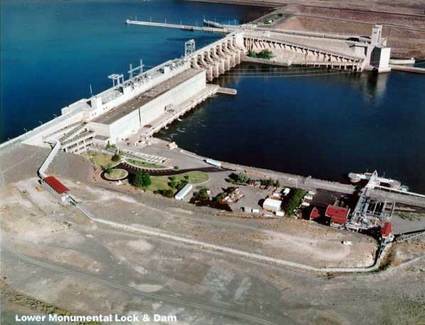 Eight dams now interrupt the flow of the Snake River. Only a fraction of the salmon manage to successfully navigate past the dams, particularly the four that block the flow of the lower river. Most other Pacific slope rivers are similarly impounded, which has had devastating impact on salmon populations. Now a new threat looms: global warming. Salmon thrive in cold water. The Snake and other rivers, including the Columbia, have warmed measurably in the last two decades. A changing climate is to blame, although dams increase the effect by slowing river waters and exposing them for longer periods to the sun. Ironically, perhaps, the salmon of the Snake River may be less affected by climate change than most other populations, because their high-altitude spawning grounds will not warm as much as other areas. The health of the Snake River salmon is thus more critical than ever to overall survival of the species. Save Our Wild Salmon (SOS), one of the more than 60 non-profit organizations featured on National Geographic's new Global Action Atlas, has worked for almost two decades to protect and restore salmon populations in the Columbia and Snake Rivers. According to SOS, up to 16 million wild salmon once returned each year to these rivers. Today as few as ten thousand make their way to the Snake. SOS advocates the removal of the four dams on the lower Snake River as a key component in a program that would benefit wild fish populations and also return miles of river, including more than 60 rapids, to their natural state. The project is actively recruiting businesses, sportsmen, farmers, conservationists, and citizens who share an interest in one of the continent's most spectacular rivers and the salmon for which it is a lifeline. Removing these man-made barriers would, SOS hopes, help ensure the survival of salmon in a warming world. Learn more about SOS, and support its efforts, via its profile on the Global Action Atlas. National Geographic Chief Cartographer Allen Carroll has been deeply involved in the creation of the Society's renowned reference and wall maps, globes, and atlases for more than a decade. He led the creation of the last two editions of the World Atlas and was instrumental in launching the MapMachine, National Geographic's first interactive online atlas. He has spearheaded the publication of many new maps and Web resources, ranging from decorative wall maps and supplement maps for National Geographic magazine to special projects featuring biodiversity, conservation, and indigenous cultures. He advises the federal government as a member of the National Geospatial Advisory Committee.